Starting life as a squat in the 1970s, Roman Road’s London Buddhist Centre now attracts guest poets such as Anthony Gormley and offers country house retreats at the Vajrasana Buddhist Retreat Centre in Suffolk, a stunning modernist jewel designed by architects Walters & Cohen. 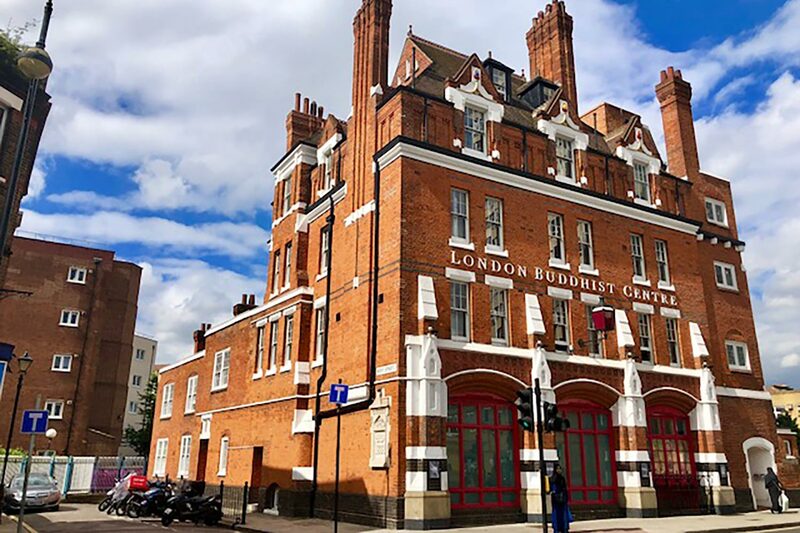 Located in a Victorian Grade II listed former fire station, this Roman Road institution has been welcoming Londoners to OMMMM in its expert-led meditation, yoga and mindfulness classes since it was founded in the 1970s. Life began very differently. 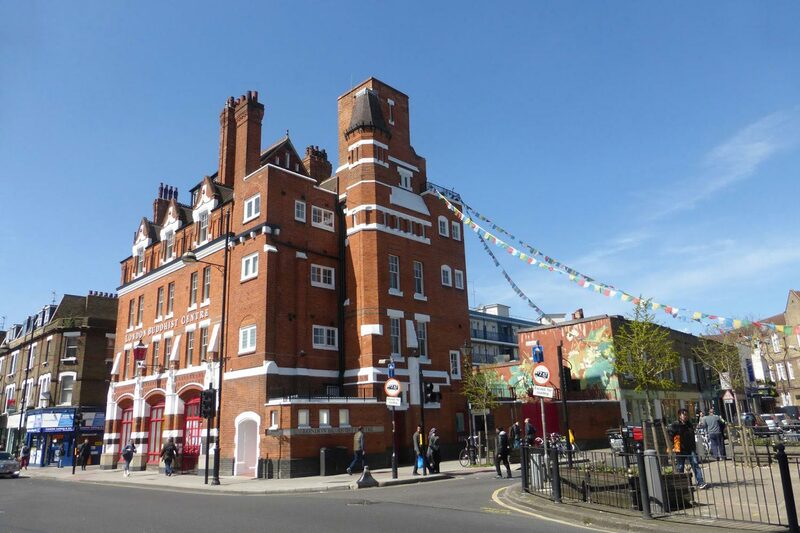 The building that now houses the London Buddhist Centre was a burnt-out, disused fire station when a group of buddhists were gifted it by Tower Hamlets Council. 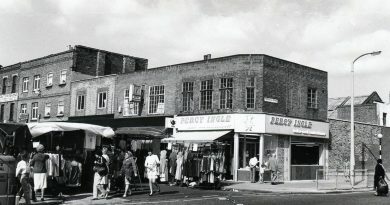 Over the next few years, they lived and worked in the building, and turned it into a Buddhist community centre that opened its doors to the public in 1978. You will have noticed the prayer flags that drape across the building outside, but you may have never entered through the little red door that leads in to the inner sanctum of the London Buddhist Centre. The lush green courtyard is collectively maintained by order members and volunteers alike, and the little stairs to the left lead down to the yoga and meditation rooms. Within Triratana Buddhism, there is a particular emphasis on friendship, and working as part of a team. People can join the order of Triratana Buddhism when they show that they are placing Buddhist values at the core of their everyday lives. As well as the Centre itself, which is open to all, the London Buddhist Centre also own living space where residential communities of up to 10 people can live. Within the building, there are three of these spaces, and they have a further three near Victoria Park. 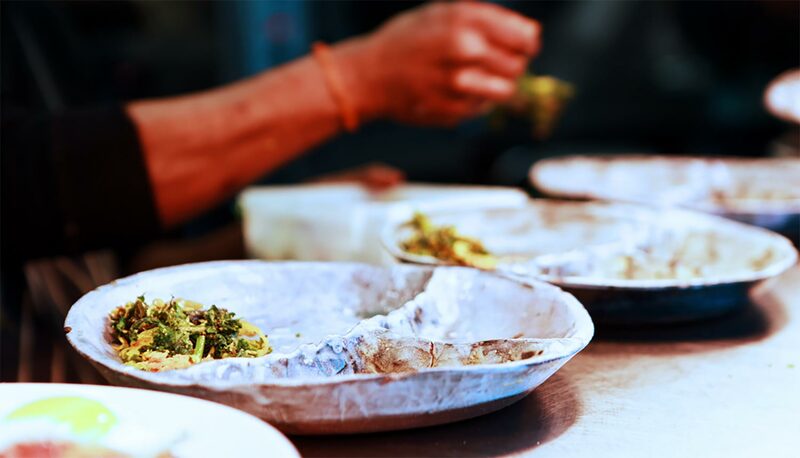 These residential communities are made up of a mix of people, all of whom are Buddhist, and most of whom contribute to the costs of the community. Those who work at the London Buddhist Centre do not pay to live there. 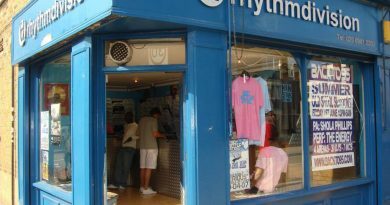 Llama’s Pyjama, a nearby charity shop and Jambala, a second-hand bookshop, are also run and owned by The London Buddhist Centre. The Buddhist Centre is a registered charity. It relies on donations, grants and some income from property rental. London Borough of Tower Hamlets Council provides funding that supports the Breathing Space project in particular. Outreach work at the London Buddhist Centre also includes entire programmes focusing on meditation and mindfulness to promote health and wellbeing in local businesses, schools and the local community. The Breathing Space project consists of eight week courses led at the Buddhist Centre with a focus on combating stress, anxiety, depression and addiction through the mode of mindfulness and meditation. 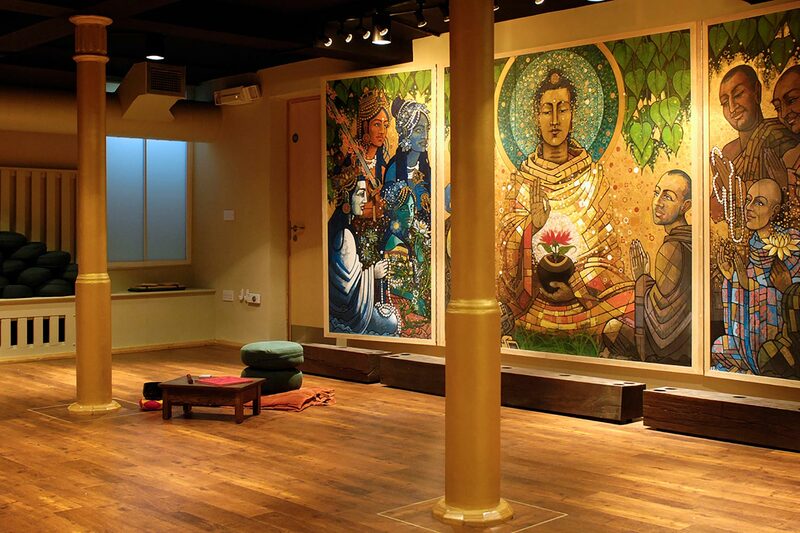 The London Buddhist Centre offers donation-based drop-in meditation and yoga sessions on almost every day of the week. 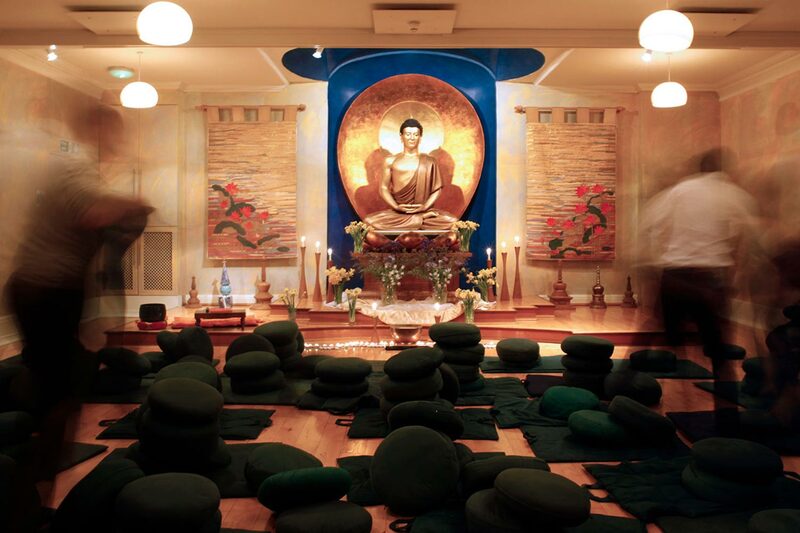 Not just a place to zen out to a soul-soothing guided meditation, the London Buddhist Centre also plays host to an ever-rotating roster of events. Particularly within Triratana Buddhism, there is a focus on the importance of art and philosophy. ‘It brings emotion and colour into people’s lives’ explains Green. Evening classes and workshops might range from creative writing courses to talks from leading Buddhist practitioners. Indeed, every Monday at 7:15, there is a lecture or seminar given to further people’s learning about Buddhism. Monthly events include poetryEast, a live poetry night in which published poets take to the stage to wax lyrical while one off lectures and seminars exploring Buddhism in the context of our world offer light mid-week enlightenment. PoetryEast is one of the few ticketed events at the London Buddhist Centre, with tickets costing £10. Maitrey Abandhu, Triratana order member, had the idea to start the poetryEast event, and continues to run it today. Successful poets and artists often attend poetryEast, with sculptor Anthony Gormley, creator of Angel of the North, being among the most famous. Offering the opportunity to break from your screens and the stresses of everyday life, the London Buddhist Centre also offers a retreat in the Suffolk countryside, giving its members the opportunity to recalibrate in a space that’s truly conducive to calm. The Vajrasana Buddhist Centre is a haven nestled into verdant British pastures. Designed by Walters and Cohen, the £5 million project has created a building combining a bare, modernist aesthetic with the stripped back principles of Dharma for a completely refreshing space to reconnect with the present moment. The London Buddhist Centre was left various lump sums of money in the wills of people who they had been involved with, and this allowed them to turn the centre into what it is today. Thirty retreats are offered each year, for just a weekend, or for a full week of meditation or yoga. Retreats range from £150-£190 and are on offer to everyone, no previous experience necessary. Most classes are by donation only, so if you are worried about affording expensive yoga classes then this is place for you. Even if you are not a member of the Triratana Order, there are still plenty of ways to get involved with the London Buddhist Centre. On Mondays and Thursdays each week at 2:30pm, volunteers come and help out around the centre. Drop in to The London Buddhist Centre at 51 Roman Road, E2 0HU, or keep up with them on Facebook here. If you liked this you may also like to read about Reverend James Hughesdon making the church accessible to all or perhaps, what Ramadan means today.